Behind the scenes information about EpicDuel's development and releases, a real-time PVP MMO that you can play online in your web browser. The final vault door has fallen to the Exile forces! John St. Alban, the man known as The Lawman has commanded the Exiles to victory over Silas and his Legion army and now has control over Baelius' most horrifying experiment - a cybernetic army harvested from the civilian population of Delta V. Now all he has to do is figure out how to turn all of them on! Fortunately for the players, Ulysses has been able to activate a few and the Lawman has seen fit to sell them to Legion and Exile forces alike to finance his next project. Whoever figures out how to activate them all will have an army of millions of cyborgs at his or her disposal. But what of the Legion? How will they fare in the aftermath of this war? The Lawman seems content to let the soldiers go free, but you can bet Alydriah won't let this insult go unanswered! Also, this Thursday we will be removing most of the War content including Missions, War Battles, and War Achievements. War weapons will be reallocated to the Light Mechachillid at the front of the Mines and the Exile Soldier in the Delta Vault. Players will also be able to sell back grenades for 15-25 Credits. You may be disappointed if you were hoping for a high sellback, but we warned players repeatedly that it would be better to throw them than keep them. Those of you who saw the end cutscene know what I'm talking about. EpicDuel is indeed planning a crossover event with MechQuest to coincide with DragonCon. We have never confirmed or denied whether or not EpicDuel takes place in the Lore Universe, but space is a big place, and there are monsters out there that transcend time and reality! How did this creature arrive at Delta V? Is it friend or foe? I guess you'll have to wait and see! 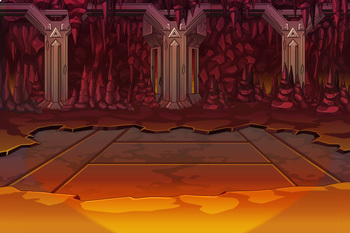 Before we say goodbye to the Infernal Mines, we will be adding a new credit-only Infernal Apartment! Be sure to decorate your new digs with a selection of Infernal items ranging from Stalagmites to Mechachillid statues! After much player discussion on the matter, this week we will be addressing bot balance. Some bot skills are wildly better than others so we will be tweaking them to encourage a better variety of effective bot strategies. I'm here to deliver some news to you guys that you might just be interested in! EpicDuel is currently looking for a Spanish translator to help translate the growing parts of the game from English to Spanish! There are a few requirements however, so you must remember to follow these rules. One thing that needs to be stressed - you MUST be over 18 years old. If you are under 18, if you don't include your age, or if you start with "I'm not 18 yet, but..." the application will not be considered! 1. Your real name, age, and country of residence. 2) More keys can unlock bigger bonuses! 4) Battles are disabled prior to a server shutdown! 5) Are you sure you want to remove Titan from the faction? Your highest Flag will lose up to 100 Tokens. This won't apply to players that are inactive for 30+ days. 6) Are you sure you want to exit battle early? You will receive a Loss and earn no Credits, Experience, or Battle Tokens. 7) Look, I’m not your friend, kid. My employer is a very powerful man - he’s got to be, to keep me in line. I’m not the only one who needs kept in line - the two big scary guys who live under the Minetower don’t seem to have any loyalty. And really, kid, where are we without loyalty? I got my own stuff to do, so why don’t you teach them some manners? Get 7 wins off of those weasels Caden and Snork, and I’ll share the bounty with you. 8) The Refinery is kept under careful guard - and with good reason. I can’t tell you how many times I’ve been called to administer first aid to some poor caverns-worker. But it is those guards we must muscle through. If each of us defeats 10 heavy or normal Mine Guards, we should be able to reduce their presence long enough to get into that evil place. 9) The worst thing has happened. Hank left a batch of candy out, and now we have an infestation of ants. I refuse to deal with critters myself; I prefer to take a more “hands-off” approach. By which I mean I’m gonna explode ‘em. Bring me 3 Gunpowder Kegs so I can explode the colony, and I’ll give you your next assignment. 10) Perfect! Just the thing to make the deep-fried battered nutritive meat substitute nice and crispy! It’s sodalicious! A lot of the space in the interface is limited, so keeping the character length of the translation close to or below the English version makes it easier for us to fit everything in. As long as too much of the meaning isn't lost, it should be alright to abbreviate, reword, or sidestep perfect grammar to make things fit. If the translation is shorter than the English, then all the better! Please send your COMPLETE application with the subject line entitled "Spanish Translator" to edtranslator@battleon.com. If the application is not complete, we will toss it out. And please - one application per person. *NOTE* This does not mean you become a moderator/tester. We have a hardworking staff of support professionals (real, human people last I checked) who are 100% dedicated to helping you fix your account. Contacting us on social networks through email will not help you get your account back any faster, and because we spend most of our time building EpicDuel, any time we might spend fixing accounts is less time we would spend building features, fixing bugs, and drawing content. NEVER give your account information to anyone! We can implement filters and automated ways to protect players having their accounts compromised in EpicDuel, but we cannot prevent players from opening giving out account information outside of the game. All the Help Team needs to access your account is your Character Name, so if anyone asks for any other information, chances are they cannot really help you. If someone promises you free varium in exchange for your account information, report them immediately! NEVER share your account. This goes along with the last post, but 99% of all hacking situations are the result of a "friend" being given access to an account. The longer an account is shared, the harder it is to determine who originally owns the account and can make an account very difficult to recover. NEVER leave your account unattended. We receive so many emails from players who allegedly left their laptop for a minute to get a drink of water and returned to find all their items sold by a sibling. NEVER download hacking tools. Not only are these illegal, but they can infect your computer with malicious code like viruses and keyloggers designed to harvest your valuable personal information -- anything from credit card numbers to your grandmother's middle name! Be sure your virus protection is up to date and you scan your system regularly to make sure your information is safe. DO use a complicated password. If your password is easy to guess, then change it immediately! http://portal.battleon.com/ It also doesn't hurt to change your password on a fairly regular basis. Mods and Devs of Artix Entertainment exercise these practices regularly, and, to date, our accounts have never been hacked and we have no additional security above and beyond regular players.